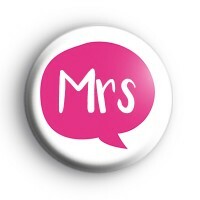 This fun Wedding themed badge has a bright pink speech bubble with the text Mrs written in a lovely white font. It is a great badge to wear to the rehearsal dinner or on your Hen Party. So everyone knows that you are the Bride to Be, the Future Mrs!We have so many fun, pretty and even a few cheeky Wedding & Hen Party themed badges in the shop so why not get badges made for your Bridal Crew, Family & Guests. They make such fun handmade keepsakes from your big day!